Californian boatbuilder Moose Boats is currently working on an aluminium fire rescue catamaran for the North Beach Volunteer Fire Department of Chesapeake Beach, Maryland, US. The newbuild will be constructed to the specifications of Moose Boats’ M1-46 class: this type features an overall length of 14.02m (or 10.82m lwl), a breadth of 4.88m and a maximum draught of 600mm – the latter factor giving the boat a distinct advantage when it comes to undertaking beach rescue work and operations in shallow waters. The M1-46 has also been designed for a freeboard of 1.22m. Upon delivery, she will mainly be used to respond to incidents on the western shores of Chesapeake Bay. Design features are set to include a walk-around, climate-controlled cabin, which will be equipped for search and rescue, patient treatment and incident command. The boat will be powered by two Cummins QSC8.3 diesel engines, generating 447kW apiece, operating alongside Twin Disc 5075SC transmissions and Hamilton HJ322 waterjets, resulting in a projected speed of 37knots. Meanwhile, to tackle blazes, the boat will be fitted with a Hale fire pump, designed to disperse water at a rate of approximately 11,365litres per minute. Other onboard electronic systems will include Garmin multifunction navigation screens, thermal imaging camera supplied by FLIR and communications equipment supplied by Icom and Sonetics. 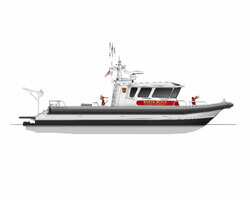 Moose Boats has also been contracted to build a second, sister boat for the North Beach Volunteer Fire Department, which is scheduled for delivery in Q1 2019.